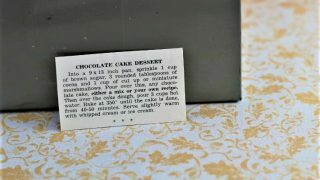 Front of the recipe card for Chocolate Cake Dessert. There are lots of fun recipes to read in the box this recipe for Chocolate Cake Dessert was with. Use the links below to view other recipes similar to this Chocolate Cake Dessert recipe. 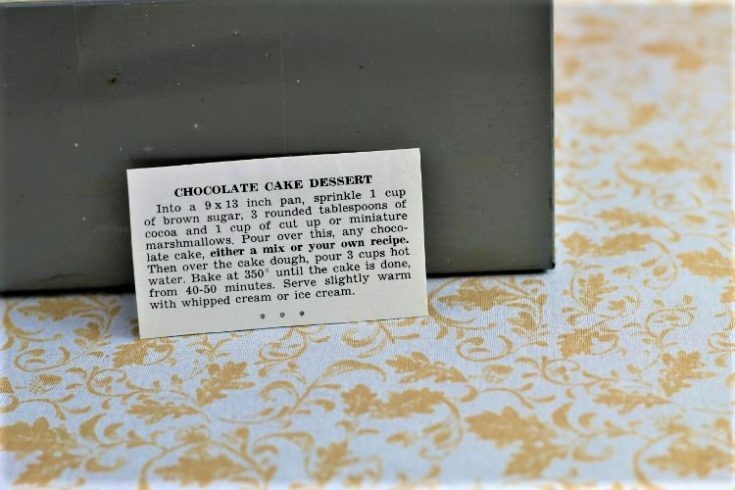 If you make this Chocolate Cake Dessert recipe, please share your photos and comments below! Into a 9 x 13 inch pan, sprinkle 1 cup of brown sugar, 3 rounded tablespoons of cocoa and 1 cup of cut up or miniature marshmallows. Pour over this, any chocolate cake, either a mix or your own recipe. Then over the cake dough, pour 3 cups hot water. Bake at 350° until the cake is done, from 40-50 minutes. Serve slightly warm with whipped cream or ice cream.